Bayern Munich and Borussia Dortmund blazed to the top of the log with convincing wins last weekend. The opening week of the German Bundesliga proved to be pretty straight forward, with yours truly striking a tasty 52/10 treble! Round two kicks off on Friday and I’m feeling confident enough to maintain that winning streak. Bayern Munich and Borussia Dortmund blazed to the top of the log with thumping wins over Wolfsburg and Bayer Leverkusen respectively, while Leipzig fell to a 2-0 defeat at Schalke. This weekend’s matchups look a tad bit tricky but the value on the betting front is just too tempting to pass up. Cologne and Hamburg will open proceedings with an eye-catching clash on Friday evening. The home side would have been disappointed with their 1-0 defeat to Monchengladbach in the first round but the Billy Goals have the quality to bounce back. Hamburg, on the other hand, got the campaign off to a winning start with a hard-fought 1-0 victory over Augsburg. The win would have given them confidence going into the match with Cologne but I doubt that will be enough. With home advantage, Cologne are tipped to claim their first win of the season. Eintracht Frankfurt will take on a wounded Wolfsburg at the Commerzbank-Arena. The Eagles played to a dull goalless draw at Freiburg on Sunday and will be eager to kick into gear with a win over the Wolves. Wolfsburg were humbled 3-0 at the hands of a rampant Dortmund last time out and will be looking to turn their early season woes around. They were not short of relegation last term and need to be weary of making another slow start to the season. Both sides will fancy their chances here and looking at the last eight meetings between the sides, a goal fest is usually expected. Get on Both Teams to Score – Yes – at 8/10. Augsburg and Monchengladbach will go toe-to-toe on Saturday with a tightly contested matchup on the cards. The hosts suffered a 1-0 loss to Hamburg in the opening round but will be determined to make amends with a victory in front of their beloved fans on Saturday. Monchengladbach started the 2017/18 season just the way they would have hoped, claiming a 1-0 victory over a stubborn Cologne side. Their tails are up and the Borussians are favourites to bag all three points. However, I’m just not so sure that will happen. Instead, I’m backing Both Teams to Score – Yes – at 8/10, with eight of the last 10 meetings seeing both sides finding the net. Stuttgart and Mainz are next up to do battle. Both sides made miserable starts to the new campaign with Stuttgart going down 2-0 to Hertha Berlin, while Mainz were humiliated on their home patch, suffering a 1-0 defeat to newcomers Hannover. Another end-to-end game of football is expected. Both teams have goals in them besides their underwhelming performances last time out. Get on the Totals – Over 2.5 Goals – at 8/10. Bayer Leverkusen and Hoffenheim will square off in what promises to be an entertaining contest. The hosts failed to keep Bayern Munich at bay last weekend, going down 3-1. Their opponents, Hoffenheim claimed their first win of the season with a hard-fought 1-0 win over Werder Bremen. Last season, Hoffenheim pulled the double over Bayer Leverkusen, scoring four goals without conceding. This clash will likely go down to the wire but I like the look of this Hoffenheim team and I’m backing them on the Win/Draw Double Chance at 13/20. Werder Bremen will play host to champions Bayern Munich. The River Islanders made a late surge up the table last season but will be hoping to make a brighter start after going down 1-0 to Hoffenheim in the opening round of the campaign. 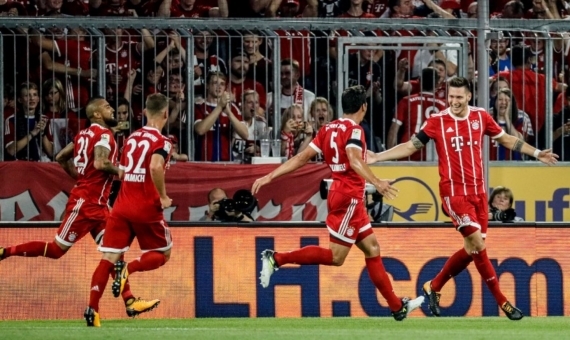 Bayern Munich made a top start to the new season with a 3-1victory over Bayer Leverkusen and will be determined to build on that, with Dortmund ahead on goal-difference. The Bavarians were also a little shaky at the back in round one but that should be worked out come Saturday. Back Bayern to Win to Nil at a valuable 23/20. Dortmund and Hertha Berlin will clash in a fiery affair on Saturday evening. The BVB made a thunderous start to the season with a whopping 3-0 victory away to Wolfsburg. Hertha Berlin claimed what looked to be a routine 2-0 home win over Stuttgart. However, the Old Lady travelled poorly last season with 11 losses from 17 matches. Dortmund Win & Both Teams to Score – Yes – is the way to go at 31/20. Sunday’s action sees Leipzig open proceedings with a clash against Freiburg. It’s difficult to predict Leipzig’s performance after they suffered a 2-0 defeat to Schalke in round one. Freiburg wasn’t much better as they played to a dull goalless draw at home against Eintracht Frankfurt. Looking at Leipzig’s home form last term of 12 wins from 17 matches, it’s easy to see why they are short favourites at 4/10. Get on the Red Bulls to win on the (-1) Handicap at even money. Round two comes to a close with an enticing clash between new boys Hannover and high-flying Schalke. Hannover caused the biggest upset in the opening week, grinding out a 1-0 win away to Mainz. Schalke were impressive as well as they claimed an excellent 2-0 home win over title-challengers Leipzig. This looks like a weekend set for goals galore and with that being said, I’m going for Both Teams to Score – Yes – at 13/20. After all, seven of the last nine meetings has seen both sides find the back of the net.